Listen to an excerpt of Michele Wucker's The Gray Rhino audiobook, read by Christine Marshall. A "gray rhino" is a highly probable, high impact yet neglected threat: kin to both the elephant in the room and the improbable and unforeseeable black swan. Gray rhinos are not random surprises, but occur after a series of warnings and visible evidence. The bursting of the housing bubble in 2008, the devastating aftermath of Hurricane Katrina and other natural disasters, the new digital technologies that upended the media world, the fall of the Soviet Union...all were evident well in advance. Why do leaders and decision makers keep failing to address obvious dangers before they spiral out of control? 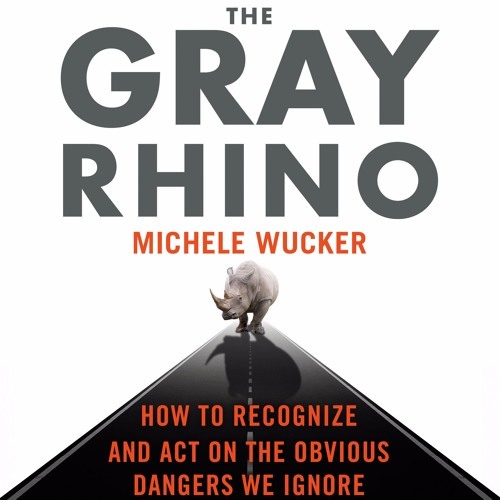 Drawing on her extensive background in policy formation and crisis management, as well as in-depth interviews with leaders from around the world, Michele Wucker shows in The Gray Rhino how to recognize and strategically counter looming high impact threats. Filled with persuasive stories, real-world examples, and practical advice, The Gray Rhino is essential listening for managers, investors, planners, policy makers, and anyone who wants to understand how to profit by avoiding getting trampled. This audiobook features an introduction read by the author.